Woe to the Enemies of Heaven! 25 new celestials, including the canny bene ishim, the inspirational ebeith-ebeil, and the courageous valorum. The avatar class can summon many of these celestials, making them instantly useable. Others make ideal mounts for righteous paladins. 7 additinal creatures from the Upper Planes, including 3 celestial dragons and the dreaded living flamestrike. 5 new templates, including the reforged and the uncalled, with fully statted out sample creatures for each. 2 sample archangles: Mika'il and Gabriel. 21 new spells for avatars, clerics, paladins, sorcerers, and wizards. 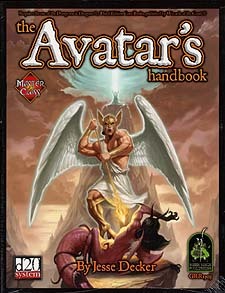 The Avatar's Habndbook also introduces a new type of magic: banner spells. Complete compatibility with Green Ronin's Legions of Hell, Armies of the Abyss, and Book of the Righteous.